Generally, you have about 18.5” to work with from the top of the countertop to the bottom of the cabinets. You can tile from the countertop to the bottom of the top cabinets or from the 4” or 6” backsplash that matches the countertop. Keep in mind, this limits your space to tile to approximately 12-14”. This can be helpful or not so helpful depending on the size of your tile. If you choose a decorative pattern for your tile, remember items like pot fillers that can end up right in the middle of your decorative pattern! Textured tiles or 3 dimensional tiles with patterned reliefs are beautiful – if you are not the person that has to clean them! If your upper wall cabinets do not end on the same line as your base cabinets and countertop, be sure to clearly choose a stopping point for the tile. 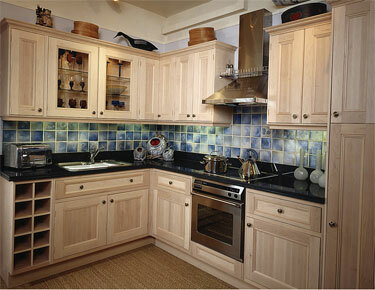 If you choose not to seal your grout, be sure to choose a color that will hide kitchen stains the most. The same material as the countertop, i.e. tile, granite, solid surface, etc. either 4” or 6” high or from the countertop to the bottom of the cabinets. Not very exciting, but practical. 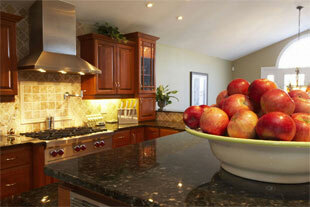 With some surfaces like solid surface countertops the transition from the countertop to the backsplash can be seamless. This is helpful from a maintenance standpoint. Mix some of the elements above and set the tile straight, but turn one row in the center on the diagonal. This can be outlined with a listello at the top and the bottom of the diagonal band if you have room or a decorative dot can be inserted in between the diagonal tiles. If you have a large enough area behind the cooking surface, add a feature like a decorative picture frame. This can be created with a listello as the frame and it gives you the option of the choices listed above to accent the interior. Solid mosaic backsplashes can be a timeless choice with an element of “punch” that will be great for you and good for resale as well.